I finally got to attend a bead show a week ago and it was AMAZING! I had such fun looking through all the wonderful pieces and meeting some of the artists I'd only previously met online! I promised I'd show you my loot, so without further ado... the pieces above are from Sue Laupp of Star Spirit Studios. As you can probably guess from my purchases, I fell in love with her raku. I also picked up several pair of copper ear wires and some really fun buttons that look like cave art. Rachel Pozehl of Two Dog Pond was such a nice lady. We had a nice chat and I left with a few of her soldered pendants and some ceramic hands. One can never have too many ceramic hands. 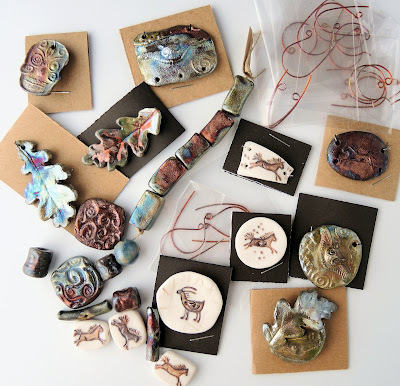 I'd wanted to meet Darcy Horn of The Jade Dog since I participated in one of her Design Challenge last fall (you can read all about that here). She was just as nice as I imagined and I left with some fun beads and clasps from her booth. I also bought some sparkly beads and some African Trade Beads from Julie's Xpressions. Boy, this is getting kind of long, isn't it. I told you I had fun! I can't leave without showing you the lampwork set I got from Jodie Marshall! I'm not finished with it yet, but I'm already working on a necklace with Jodie's beads. And last, but not least, I got these cool clasps from Dan Starkey of Ayla's Originals. See - I wasn't kidding when I said I had a really good time! Many thanks to Stephanie and to all the vendors there for putting on such a great show. Especially I like lampwork flowers!